Chiavettieri is a typeface created by Nikola Kostic and published by Kostic that was inspired by Humanist types but it has a contemporary look. Equipped for typography, robust but well balanced make’s it perfectly for editorial use, text, book, magazine, web etc. 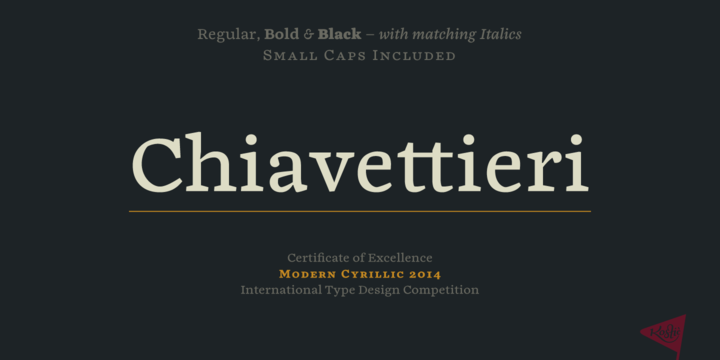 Note: Certificate of Excellence Modern Cyrillic 2014 International Type Design Competition. A font description published on Thursday, May 7th, 2015 in Fonts, Kostic, Nikola Kostic by Alexandra that has 2,925 views.